Gum recession is exposure of the roots of the teeth that occurs as either a loss of gum tissue or when the gum tissue retracts. Many of our patients have recession to some extent. So, if you have cold sensitivity or sensitivity during cleanings, be sure to discuss the possibility that you may have gum recession. Recession commonly comes from clenching and grinding, brushing too hard, acid reflux or a history of wearing braces. Prevention of further recession may include treatment with a night guard, a change in your brushing technique or treating acid reflux. 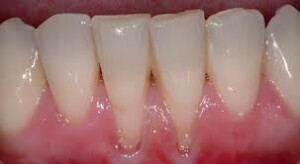 Unfortunately, once recession occurs, your gums will not “grow” back. So, in minor cases we simply do our best to ensure that it does not get worse. In severe cases, a referral to a gum specialist may be necessary. Not all patients who have recession experience sensitivity. If you’re one of the lucky ones who is asymptomatic, it is still important to understand that there are risks. Because the root surface is so soft, you can actually start to scrub your roots away over time! Be cautious of heavy handed brushing. The roots are then also more susceptible to decay. If sensitivity is an issue for you, there are some options! Using a sensitive toothpaste on a daily basis can help to seal up small tubules on your roots. An in-office treatment called a fluoride varnish can also be placed after your cleanings. This varnish protects and restores roots as well as seals them away from cold sensitivity. A varnish treatment twice a year can really decrease your sensitivity! If localized areas have been worn away, your dentist may recommend placing a small white filling in that area. This can also aid in reducing sensitivity and reduce your risk of decay reaching the nerve. We measure and monitor your recession for you on a yearly basis, so it is important for you to see us for your cleaning and check ups. Together we will work hard at keeping your smile beautiful and pain free!